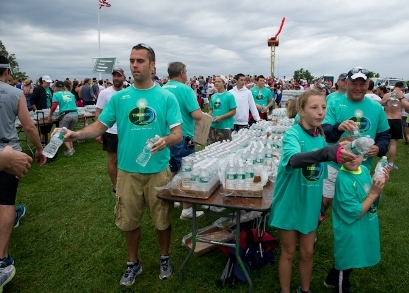 CAPE ELIZABETH, Maine (June 20, 2014) – Volunteers are needed for the TD Beach to Beacon 10K Road Race on Saturday, Aug. 2, as well as in the days leading up to the event. While many have already signed up to donate their time, Cohen said volunteers are still needed for the parking and shuttle program as well as in recycling. There are also spaces available before the race assisting in runner registration on Friday, Aug. 1 and also for the Kid’s Fun Run that same day at Fort Williams. 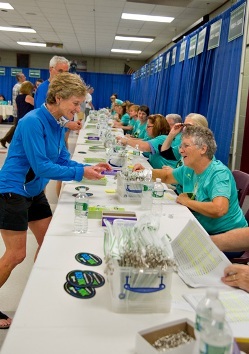 New and returning volunteers can sign up on the race website at http://www.beach2beacon.org/VOLUNTEER. 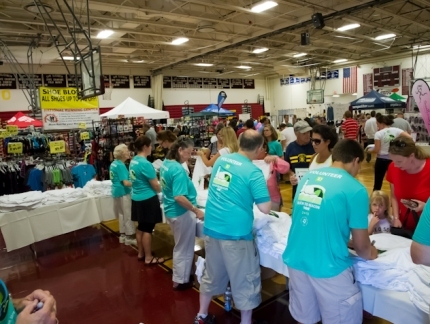 In return for their efforts, volunteers receive a commemorative tech T-shirt and are invited to a party during race week in a coastal Cape Elizabeth locale, organized exclusively for them. The TD Beach to Beacon 10K needs about 800 volunteers to ensure a smooth operation for the 6,000+ recreational runners and world-class athletes alike who will wind their way from Route 77 near Crescent Beach State Park to Fort Williams Park and the Portland Head Light, the most photographed lighthouse in the world. A list of available jobs is available on the race website and is updated daily. Groups interested in volunteering together should contact Maya Cohen at cohemm@gmail.com. The race also honors a longtime volunteer with a special annual award. The 2013 Volunteer of the Year award went to Dorothy Diggs of Portland, a therapeutic massage specialist who has volunteered on the race’s massage therapy team for all 16 TD Beach to Beacons. The 2014 race beneficiary is Rippleffect (www.rippleffect.net), a Portland-based non-profit youth and community development organization leading outdoor adventure programs on Cow Island, in area schools and in the mountains of western Maine. The organization will receive a check for $30,000 from the TD Charitable Foundation, the charitable giving arm of TD Bank, America’s Most Convenient Bank®. In addition to the TD Charitable Foundation, other major corporate partners include Hannaford, Nike, Poland Spring, Fairchild Semiconductor, IDEXX, Northeast Delta Dental, MaineHealth, Dead River, Olympia Sports and WCSH6. For additional information about the race, visit www.beach2beacon.org, call the race hotline at (888) 480-6940 or find the race on Facebook and Twitter. The TD Charitable Foundation is the charitable giving arm of TD Bank N.A., which operates as TD Bank, America’s Most Convenient Bank®, and is one of the 10 largest commercial banking organizations in the United States. The Foundation's mission is to serve the individuals, families and businesses in all the communities where TD Bank operates, having made $118.9 million in charitable donations since its inception in 2002. The Foundation’s areas of focus are affordable housing, financial literacy and education, and the environment. More information on the TD Charitable Foundation, including an online grant application, is available at www.TDBank.com.